Today we will discuss with you apps that can help you duplicate iPhone apps. There are many people out there who are managing at least two social media accounts on the same social media platform at the same time. The app duplicator lets you stay logged in and use the both social media accounts at the same time. 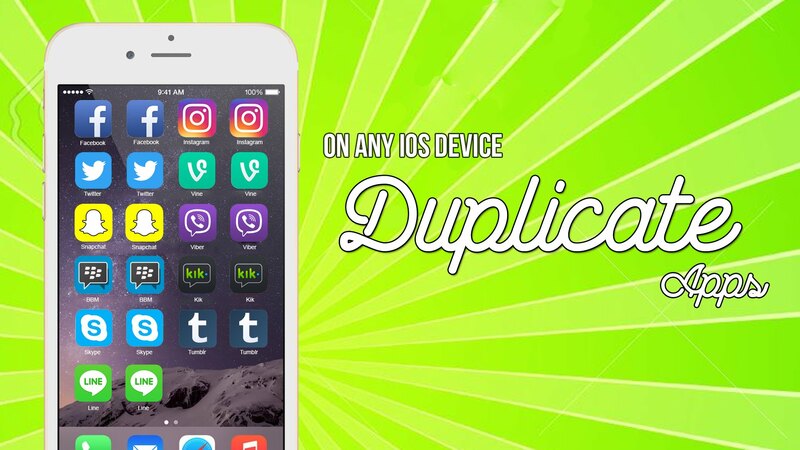 The app that we recommend you to use to duplicate iPhone apps is App Duplicator, a very popular Cydia tweak. Apps like App Duplicator are extremely useful Cydia tweaks that let you duplicate iPhone apps of your choice. For those who have many social media accounts to manage have to face a lot of difficulty and have to switch their accounts many times. The standard method to use different accounts is to logout from one account and then login to the other. Repeat! There are very few apps like Instagram that have built-in feature to allow you run multiple accounts. Facebook has recently made it a little bit easier by allowing you to switch between your multiple accounts by just clicking on the profile picture. Google is another such exception but there are many, many apps out there that don’t have any feature to let you manage two accounts at one time. Developed by iMokhles, App duplicator is an app that lets you duplicate iPhone apps. It’s a Cydia tweak so it requires you to have Jailbreak on your iPhone or iPad. You can clone your apps and run multiple instances of the app of your choice on your iOS device. When you install App Duplicator, it shows you a list of all the apps that you can clone using App Duplicator. Find the ones installed on your device and the ones you want to duplicate. Once you choose the apps you want to clone, hit install to duplicate the iPhone apps you chose. You can find the duplicated iPhone app next to the original app. You can duplicate iPhone apps as many times as you want with App Duplicator. Although App Duplicator hasn’t given me any trouble so far, many users have complained that they are getting some issues when they duplicate iPhone apps. Some users have experienced that their duplicated iPhone apps crashed upon launching. But the incidents have been rare and were fixed by reinstalling the app. This is a Cydia tweak so you need to Jailbreak your devices before using App Duplicator. Follow the steps below to install App Duplicator on your iOS devices and duplicate your iPhone apps. Launch Cydia and wait for its sources to refresh. Install App Duplicator from the developer’s repo. To use App Duplicator to duplicate iPhone apps, go to stock settings app and find App Duplicator. You will find the list of apps that are supported by App Duplicator for cloning. Browse the apps and select the apps you want to duplicate. That’s as simple as it gets. The developer had been thoughtful enough to implement many other useful features such as remote fetch and system requests. The app Duplicator also has the ability to push notifications when an update is available. It is a great tweak that helps you manage your multiple social media accounts for the same platform on the same device. However, bear in mind that when you duplicate an iPhone app, the clone app is always of the latest version of the app. Even if you have a downgraded version for the original app, its clone will always be up-to-date.